The race for GC is still wide open. No serious climbing yet, no big selections. There's going to be an interesting race for the green jersey. The crashes in the first week were worse than usual, and eliminated more contenders than usual. Bradley Wiggens, Jurgen van den Broek, Chris Horner, Alexander Vinokourv. Alberto Contador had a bad week, lost four minutes, and crashed a lot. But he's still right there. Plus he won no stages and looked vulnerable. 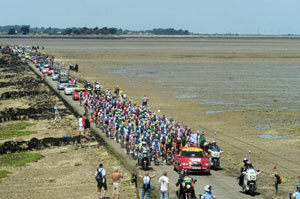 Cadel Evans had a great week, he's in the lead among the contenders, and stayed out of trouble. Plus he won a stage and looked strong. Andy and Frank Schleck also had great weeks, they're right there, no crashes. The sprint battles have been pretty much as expected, with Mark Cavandish winning two stages, but Tyler Farrar got one and so did Eduard Boassen Hagen. Meanwhile Jose Joaquin Rosas has stayed close all the time. Thor Hushovd was a great leader for the first week. He looked good in yellow, and he'll be up there battling for green you can be sure. Rabobank has reason to smile, with Luis-Leon Sanchez winning a stage and sitting in second place, and Robert Gesink in the white jersey and in the GC hunt. Sanchez could stay up there, he's a great climber and a solid time trialer. Johnny Hoogerland's horrible crash and subsequent recovery have made him a hero. I doubt seriously he can hang on to the polka dots, but who knows. Thomas Voeckler in yellow is awesome. Everyone likes him, and while he isn't a threat to win overall, he could hang on to it longer than anyone thinks.